This lovely Outer Banks Oceanfront home in Whalehead has each room beautifully appointed with the style of easy & relaxed elegance. Level 1: Bedroom (Duo) with TV; Game room with a bumper pool table, kitchenette, full frig and TV; full hall bath; laundry. Level 2: Master Bedroom (King) with deck access; Master Bedroom (Queen) with deck access; Bedroom (Queen) with TV and Bedroom (two twins) share full bath; private den (QSS) with deck access. 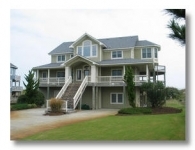 Level 3: Master Bedroom (King) with private deck, TV and ocean views; Great room with TV; kitchen; dining area; half bath. Level 3.5: Sun Room with sitting area and ocean views.